Fannie Mae and Freddie Mac have been hot stocks this year. They just got hotter after Bill Ackman took a stake. 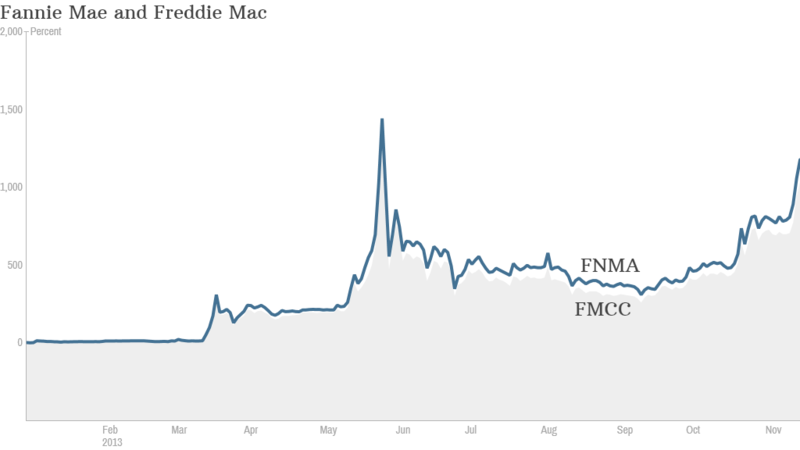 Click the chart to track shares of Fannie Mae. Bailed-out mortgage giants Fannie Mae and Freddie Mac are apparently all the rage. Activist investor Bill Ackman disclosed Friday that his firm Pershing Square has taken just under a 10% stake in each of the government-sponsored mortgage giants. Pershing Square owns more than 115 million common shares of Federal National Mortgage Association (FNMA) and over 63 million common shares of Federal Home Loan Mortgage (FMCC) Corp, according to government filings. The stocks surged on the news and based on where they were trading Friday, his investment in Fannie Mae is worth more than $380 million, while his bet on Freddie Mac is worth about $200 million. Related: We're still on the hook for Fannie Mae and Freddie Mac. Let's abolish them. Fannie and Freddie have been overseen by the Federal Housing Finance Agency since their $187 billion bailout in 2008, prompted by massive losses on mortgage securities. They have since returned to profitability, paying substantial dividends to the Treasury Department, and have caught the eye of investors, particularly hedge funds including Bruce Berkowitz's Fairholme Capital. Both stocks were delisted from the New York Stock Exchange in 2010 and their shares were moved to what's known as the over-the-counter bulletin board, or pink sheets. The two stocks each trade for a little more than $3 apiece. But shares of both companies are up more than 1,000% so far this year, and gained almost 10% Friday on the news of Ackman's stake. 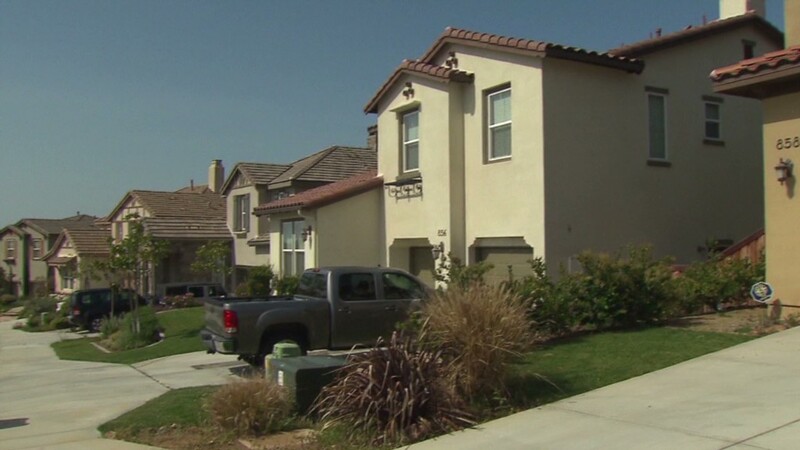 During an interview on CNBC Thursday, Berkowitz, who is also the biggest shareholder of bailed-out insurer AIG (AIG), said he wants to buy the insurance components of Freddie Mac and Fannie Mae from the government. Berkowitz said "there are no other group of assets that can perform the job necessary for American housing." "We have the infrastructure. We could have the money. We can make a reasonable return. We don't have to be greedy. We don't need federal support," he added. In the SEC filings, Ackman said the shares of Fannie Mae and Freddie Mac are undervalued and attractive, and he also cited Fairholme's proposal as a reason for his purchase. Ackman is well-known on Wall Street for investing in companies with the hopes of convincing management to make big changes. This year, his bet on struggling retailer J.C. Penney (JCP) flopped. Ackman sold his stake at a loss after CEO Ron Johnson -- who Ackman helped lure from Apple (AAPL) -- was fired. Ackman also is sitting on a huge loss on paper with his short against nutritional supplement maker Herbalife (HLF). Shares of Herbalife have more than doubled this year even though Ackman has claimed on numerous occasions that he thinks the company is a pyramid scheme that has no value. Making matter worse, rival activist investor Carl Icahn has a big stake in Herbalife and has profited handsomely from the stock's rise. The two even exchanged testy words about Herbalife in a CNBC appearance earlier this year. But Ackman has had one notable win this year. His stake in Procter & Gamble (PG) has been a winning investment. CEO Bob McDonald resigned earlier this year, a move that was largely attributed to pressure from Ackman. P&G shares are up 25% this year and the stock is at an all-time high.